Italian dressing is a vinaigrette-type of salad dressing in United States and Canadian cuisine, consisting of water, vinegar or lemon juice, vegetable oil, chopped bell peppers, usually sugar or corn syrup, and a blend of numerous herbs and spices including oregano, fennel, dill and salt. Onion and garlic can also be used to intensify the dressing’s flavor. It is often bought bottled, or prepared by mixing oil and vinegar with a packaged flavoring mix consisting of dehydrated vegetables and herbs. North American-style Italian dressing is not used in Italy, where salad is normally dressed with olive oil, vinegar or lemon juice, salt, and sometimes black pepper at the table, and not with a pre-mixed vinaigrette. 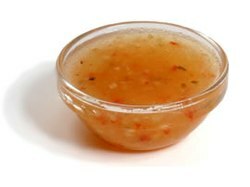 Italian dressing is also used as a marinade for meat or vegetables, for stir-frys, and on sandwiches. Pasta salads sometimes include Italian dressing. The caloric content of Italian dressing varies widely. A variety of Italian dressing, known as creamy Italian, consists of the same ingredients, but with milk products and stabilizers added to make the salad dressing creamy. North American style Italian salad dressing is thought to date back to 1941 in Framingham, Massachusetts. Florence Hanna, the daughter of Italian immigrants and wife of restaurateur Ken Hanna, made large batches of her family's salad dressing for the house salads at the restaurant. The restaurant, originally called The '41 Cafe, later changed locations and became known as Ken's Steak House. The salad dressing became so popular that it was made in large vats in the basement of Ken's to keep up with demand. Customers started requesting the Italian dressing to go. The Crowley family, who owned a nearby manufacturing business, approached the Hanna family about bottling the popular salad dressing. This resulted in the creation of Ken's Salad Dressing, which now comes in several variations of Italian, as well as many other flavors. Italian salad dressing was also served in Kansas City, MO at the Wishbone Restaurant beginning in 1948. The Wishbone had been opened in 1945 by Phillip Sollomi along with Lena Sollomi, Phillip's mother. The Italian dressing served at the Wishbone was based on a recipe from Lena Sollomi's Sicilian family which was a blend of oil, vinegar, herbs and spices. Demand for the salad dressing proved so high that Phillip started a separate operation to produce it for sale, making it by the barrel. The dressing recipe was eventually purchased by Lipton and has been made commercially by a succession of owners since, with the product currently made by Pinnacle Foods, Inc.
^ Biba Caggiano (2002). Biba's Northern Italian Cooking. Penguin. p. 188. ISBN 9781440623912. Retrieved 4 February 2016. ^ Ernest A. Liner (2005). The Culinary Herpetologist. Bibliomania. p. 147. ISBN 9781932871067. Retrieved 4 February 2016. ^ Melissa Barlow (2009). 101 Things to Do with a Salad. Gibbs Smith. p. 59. ISBN 9781423614357. Retrieved 4 February 2016. ^ "Salad Dressing Calorie Counter". CalorieLab. Retrieved 2012-05-07. ^ Y. H. Hui & Frank Sherkat (2005). Handbook of Food Science, Technology, and Engineering. CRC Press. p. 139. ISBN 9781466507876. Retrieved 4 February 2016. ^ "How Ken's became Ken's". Archived from the original on 9 August 2017. Retrieved 8 August 2017. ^ a b c d Andrea L. Broomfield (2016). Kansas City: A Food Biography. Rowman & Littlefield. pp. 140–142. ISBN 9781442232891. Retrieved 4 February 2016. ^ "Wishbone Products - Italian Salad Dressing". Pinnacle Foods Inc. 2016. Retrieved 4 February 2016. ^ "Pinnacle Foods Inc". Pinnacle Foods Inc. 2016. Retrieved 4 February 2016. This page was last edited on 12 December 2018, at 17:31 (UTC).